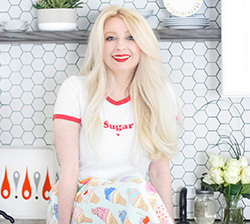 These pies begin with my favorite sweet golden crust. Pate sablee is a French pastry dough that has a low flour ratio with big buttery flavor and a soft texture. I love using it to make apple pies, but it is absolutely wonderful in this recipe. It's a nice foil for the sweet-tart lemon filling. There was a time when I made this dough by hand, scraping and cutting it together with a bench scraper on my counter top. Recently I've found it's a quick fix in a food processor, and it yields consistently good results. Just four steps gets you there! Pulse together the butter and dry ingredients until the mixture resembles cornmeal. Add the egg and pulse again until dough begins to clump. Keep pulsing until the dough forms a ball to one side of the processor bowl. Form into a ball, cover, and rest for 30 minutes in the refrigerator. 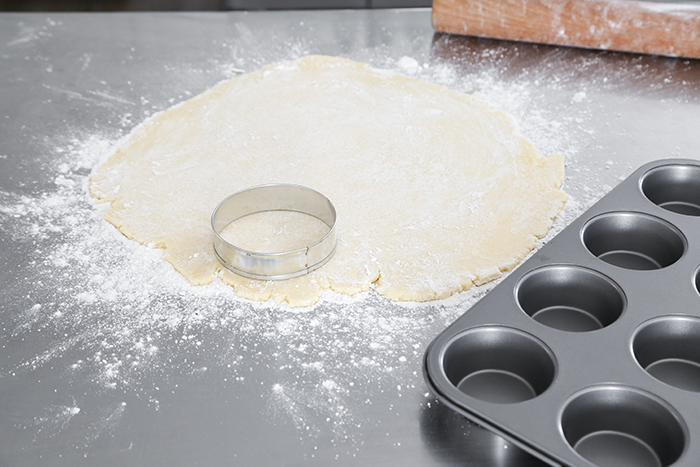 You'll need a 4 inch round cutter to stamp circles from the rolled dough. I used an English muffin form. You could also use a cup or bowl with a 4-inch round opening. The crusts will need to be blind baked for about 20 minutes with pie weights. Cupcake liners filled with dried rice (or beans!) will work just fine for this. After baking, the liners are removed and the crusts are baked for a second time until golden brown. It's Meyer lemon season, so use them while you can! They make a lovely mild-tasting lemon curd with floral notes. It's the best gift that winter gives us, if you ask me. 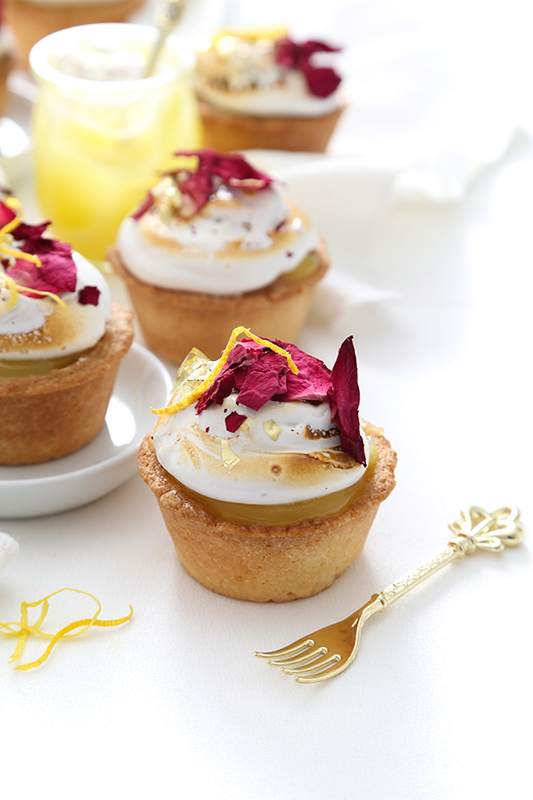 The topping is true homemade marshmallow piped and swirled over the lemon curd. 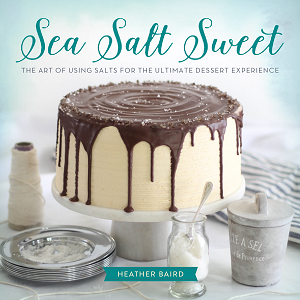 Toasting it gives the entire dessert a lemon s'more vibe, which I love! I used a kitchen torch for this, but you can also put the pies in a well-preheated oven broiler for a few seconds. 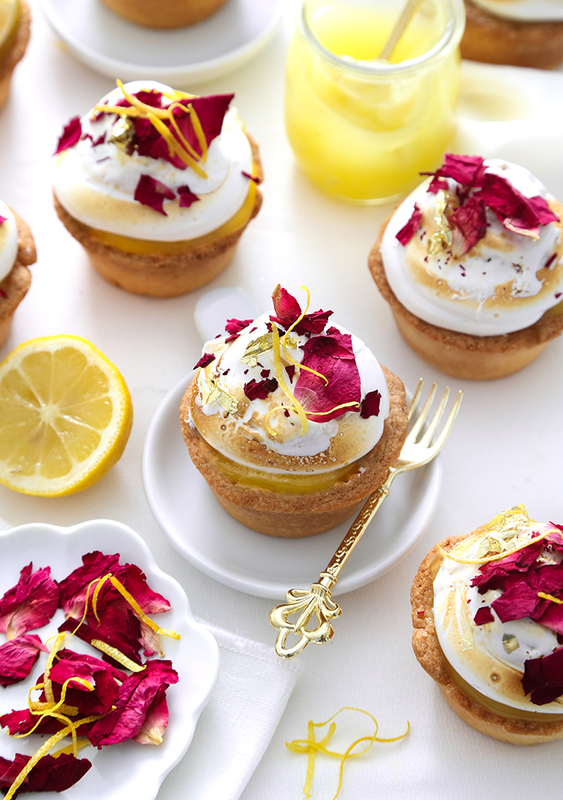 These little pies need no further garnish, really, but edible dried rose petals will make them a pretty sight. The light flavor of the petals is a nice compliment to the floral notes of Meyer lemon, too. A little edible gold leaf gives them some sparkle, but it is completely optional. 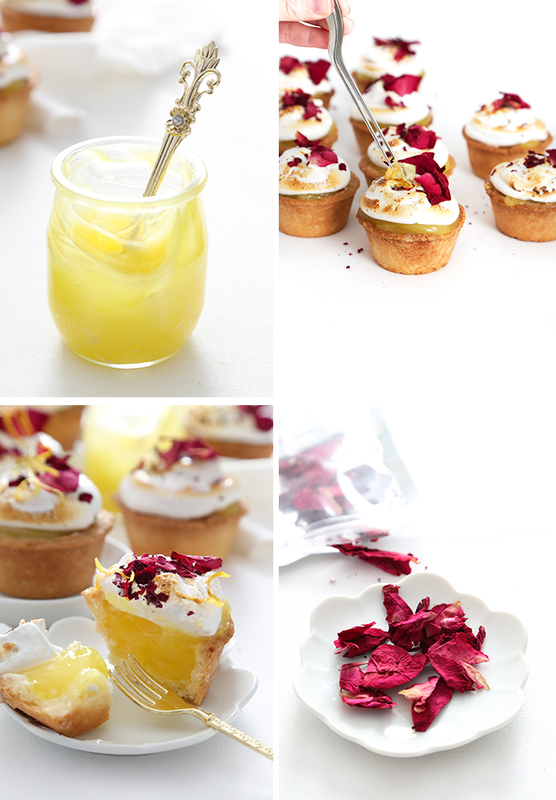 You can find the culinary grade petals I used for purchase here, and the gold leaf here. This recipe makes 12 mini pies, which is plenty to share! The lemon filling can be made up to three days ahead and stored in the refrigerator. 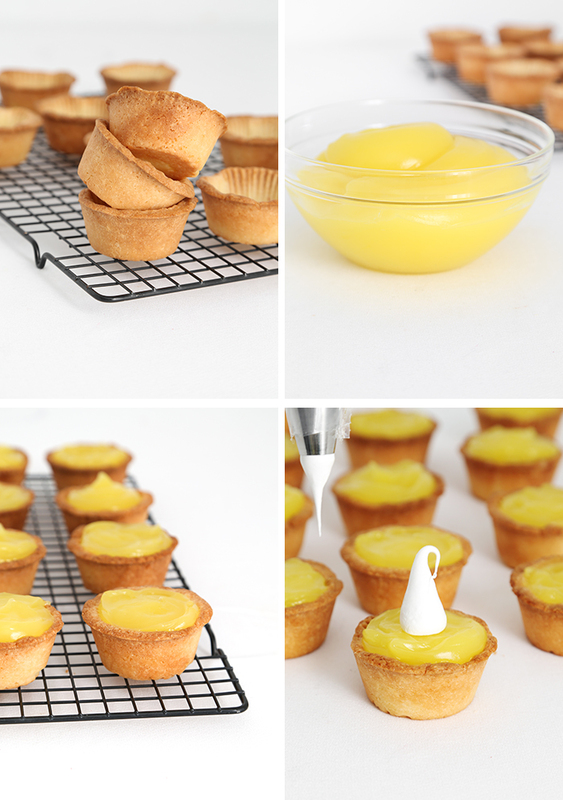 You may also shortcut this recipe by purchasing ready-made lemon curd. You’ll need about 24 ounces to fill the crust cups. Make the lemon filling: Combine the sugar, cornstarch and egg yolks in a stainless steel (or nonreactive) saucepan. Cook over medium-low heat, whisking constantly until the mixture is smooth and the sugar dissolves (about 2 minutes). Add the lemon zest and lemon juice and continue to cook, whisking constantly until the mixture is thick like pudding, about 5-7 minutes. Add food color, if using. Strain the mixture through a fine sieve into a bowl. Whisk in the butter one cube at a time, until smooth. Stir occasionally until the mixture is cool, or refrigerate (still stirring occasionally). You may also place the bowl over a larger bowl filled with ice to speed cooling. 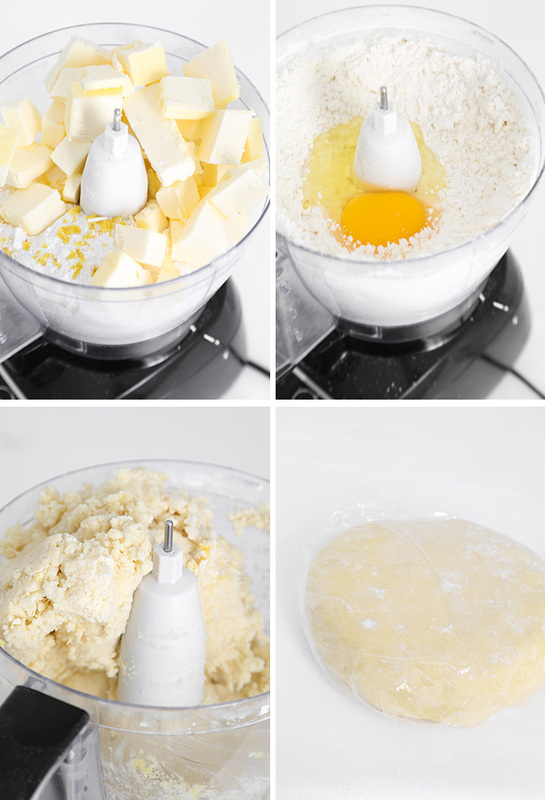 Make the crust: Add the flour, sugar, salt and lemon zest to the bowl of an electric food processor. Pulse twice to mix. Add the cold butter on top of the flour mixture and pulse until the mixture resembles corn meal. Make a well in the flour on one side of the bowl and add the egg. Pulse in long bursts until the mixture starts to clump. Add 1 tablespoon ice water and pulse until mixture forms a ball to one side of the bowl. Add additional water 1 tablespoon at a time if mixture is still dry and won’t form a ball. Remove the pastry to a lightly floured surface and form into a ball; flatten to a disk. Cover with plastic wrap and let the pastry rest in the refrigerator for 30 minutes. Place the chilled dough onto a lightly floured surface and roll to about 1/4 inch thickness. Cut out twelve 4 1/2-inch rounds of dough using a cookie cutter. Place a round into the cavity of each cup of a nonstick muffin tin. Use your fingers to press the dough flat against the bottom corners of the pan, and also up the walls of the cavities. (A shot glass with a flat bottom is a good tamping tool for the crust bottoms.) Freeze the dough in the pan for 15 minutes. Remove pan from freezer. 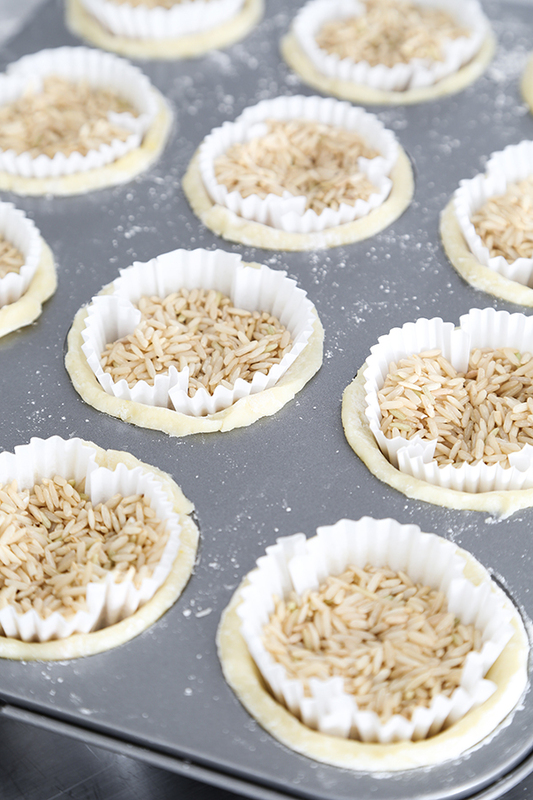 Fit a cupcake liner on top of each crust and fill with pie weights (dried rice works well!). Bake for 20 minutes. 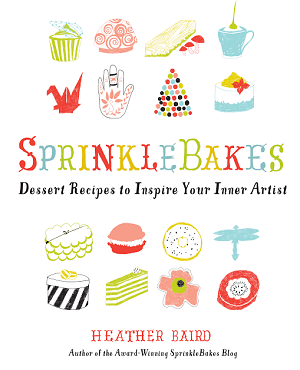 Carefully remove cupcake liners with the pie weights from each crust. Bake for an additional 15-17 minutes, or until the crusts are golden brown. Let crusts cool in the pans for 5-7 minutes, or until they are firm enough to lift from the pan. Place on wire cooling racks to cool completely. When the cups are cool, spoon or pipe the lemon filling into each cup. Refrigerate the cups while you prepare the marshmallow topping. Make the marshmallow topping: Sprinkle the gelatin over 1/4 cup of the cold water in the bowl of an electric mixer fitted with the whip attachment. Combine the sugar, corn syrup and the remaining 1/4 cup of water in a saucepan and bring to a boil over medium-high heat. Cook until the mixture reaches 240°F on a candy thermometer. Remove from heat. With the mixer running on low speed, gradually pour the syrup down the side of the mixer bowl into the gelatin mixture. When all the syrup is added, increase to high speed and beat for 6 minutes, until the mixture is thick and opaque. Beat in vanilla extract. Immediately transfer the mixture to a piping bag and pipe the marshmallow on top of each pie. Alternatively you may spoon the mixture on top of the pies. Lightly brown the marshmallow with a kitchen torch, or under a well-preheated broiler in the oven (watching very carefully!). 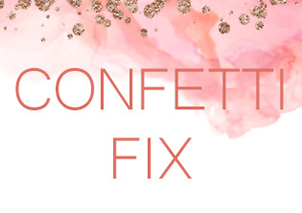 Add decors: Sprinkle rose petals over marshmallow while it is still sticky. Add gold leaf with kitchen-dedicated tweezers. Zest ribbons of lemon peel and garnish with the peel just before serving so it is fresh and fragrant. We have a Meyer lemon tree and today is the day I plan to make a big batch of curd and can it. 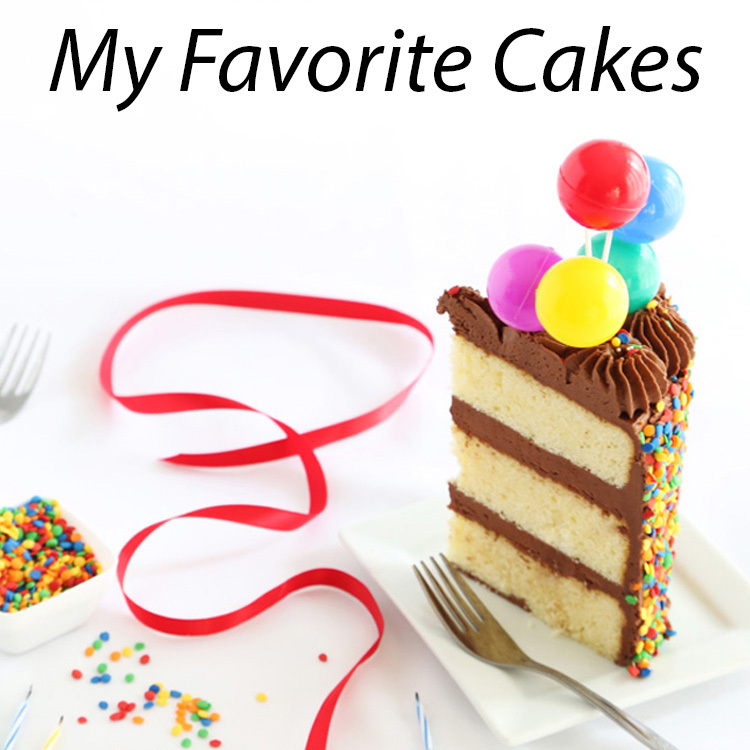 You hit all of my favorite flavor notes with this beautiful recipe-- my favorite pastry crust, lemon curd and marshmallow! Lemon is my chocolate. Your version is absolutely gorgeous! When are you going to make a calendar with some of your best food shots? I'd buy them! Debby, you are the sweetest! Thank you for the kind words. How wonderful to have your own Meyer lemon tree. I bet your lemon curd is the best ever! These look utterly gorgeous, can't wait to try these out! Where did you get those beautiful little gold forks as well, I love them! Thank you Rachel! The little gold fork is from a set of mini coffee spoons and fruit forks. You can find them at the following link. I try not to ask questions with obvious answers, but... I am going to make these on Sunday and take them to school for a fellow teacher's birthday on Monday. I know meringue would weep, but am not sure how the marshmallow will fare if I torch it on Sunday night. Do you suppose it will keep and hold up ok? I hate to go to all the work of making these, ( and they look delicious! ), but I want them to still be presentable the next day. Thank You! Hi! That's a very good question! I have two pies remaining with toasted marshmallow in the refirgerator, and they've been kept in an airtight cupcake carrier for 6 days with no weeping! Marshmallow is definitely more stable. You should be good to go! I wish I could add a picture here for you to see. They look as good as they did on day 1. Good luck with the recipe!